See previous – Mistake #10: "The Dyson Effect"
What I am referring to here is a reliance on historical data – particularly data from last year. In the top 10 rankings of applicants mistakes for the class of 2016, this is the only one where there is a great deal of overlap for law schools. In other words, law schools make this mistake just as much as (or more than) law students. It is harming both students and schools alike. But, I am here to talk about the law school applicant side of things. Let’s look at some data. 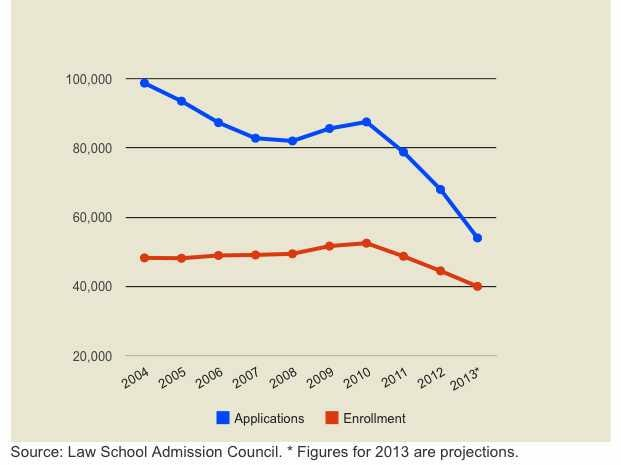 Easily seen on the graph, then, is an inflection point towards a 1 to 1 ratio of applications to enrollment. Good for the legal community? Perhaps not. Good for law school? Definitely not. Good for YOU, the applicant. Heck yes. But the bigger problem this year is that the times (or in this case medians) they are a changin. Let me say it right now, the median LSATs and uGPA at many law schools are going to sink like a stone. Put another way, due to the lack of supply of applicants and corresponding (even higher) lack of LSAT scores at 165 and above, there are going to be some select “winners” among law schools and a great deal of “losers” who will miss on on class metrics that they had last year. This means, of course, it is a buyers market unlike ever before. Do not worry so much about the exact medians of last year to predict what your chances of admissions may be. I have clients who are below both medians from last year admitted at their top schools. Do not look at scholarship results from last year as a predictor of this year. I have clients who, compared to admitted students with the very same numbers on lawschoolnumbers.com from last year, have already received double the amount of scholarship offers form the same school. Leverage is in your court this year and many of the past models of predictive value for admissions and for merit scholarships can be thrown out. Look at THIS year’s data, when you can, and realize you are approaching this cycle from a position of power. Full disclosure There isn’t a Part II, but then again I don’t think the Mel Brooks movie “History of the World” had a part II either.